Two years ago Westminster politicians, Ministry of Defence top brass and their cronies in big business were slapping each other on the back about a new military training academy in St Athan in the Vale of Glamorgan. 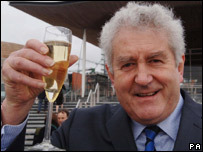 In Wales first Minister Rhodri Morgan popped the champagne corks on the Senedd steps and the Welsh media crowed about a £14 billion contract and around 6,000 new ‘high-quality’ jobs. It’s taken a while, but the plan is now unravelling as it becomes clear it’ll be a complete failure. 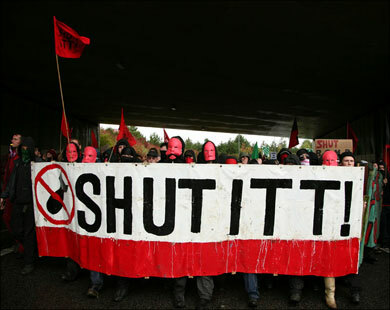 South Wales anarchists have been saying this all along, of course. The deal would mean the privatisation of military training. The power to train soldiers, navy and airmen and women would be handed to a bunch of dodgy arms dealers who make up the Metrix Consortium; companies like Raytheon, who manufacture cluster bombs which kill thousands of civilians. We talked to the unions representing those who train the army and found out most of the instructors were against it, too. They didn’t want to move to St Athan, and they didn’t want to work for private companies. Researchers looked at the jobs claims and found out that the 6,000 figure was pie in the sky – most of the ‘new’ jobs would be relocated from other parts of the UK and the small number left over for locals would be low-skilled service jobs such as cooking and cleaning up after trainees. We went to the Vale and talked to residents and found out there’d been no proper consultation and that hardly anyone had any idea of the scale of the new academy. They had no idea that St Athan would be turned into a massive garrison town through which every new member of the UK’s armed forces would pass. Slowly, everyone else seems to be catching up with us! A string of setbacks has meant that the project looks in danger of going under. The lucrative ‘phase 2’ of the project was scrapped much to the annoyance of its supporters. Staff at the Open University, who are involved with the consortium of ‘defence firms’ behind the project, have started to complain about consorting with such scum. The scheme is running over budget with the price rising from £11bn to £12bn and senior MOD officials have joined opposition in the rank and file, one senior general describing it as ‘Alice in Wonderland’. A top air force officer complained that allowing companies to profit from military training would lead to cost-cutting and would put UK forces in danger. Tory MP Mark Pritchard has said that moving training from RAF Cosford to St Athan ‘would put frontline operations at risk‘ and others have questioned how realistic the plans are. And, most damaging, the MOD’s senior defence training review board has voiced serious concerns about the viability of the plans, suggesting it is not affordable, and it poses ‘intolerable’ risks. This time, we actually quite like saying ‘we told you so’!